The display module uses the same hardware as our TC-Pod as used for standard DTC control. It is however programmed differently for TCS applications so do not try and interchange modules, these instructions only relate to the software version as used by the TCS. The TC-Pod display allows you to do all of the following while riding. • TCS level UP/Down through 1>9 via integrated or external push buttons. • Multi LED display to indicate the amount of TCS correction being applied in real time. Steps 1>15. • Numeric display of the current TCS level. • Adjustable back lit displays for day or night riding. • Warning LED in case of TCS errors, and built in selfdiagnostic capability. • Communicates with the TCS over CAN. The TC-Pod can be fitted either directly to the handlebars or centrally in front of the dash. Depending which kit you buy will determine the TC-Pod mounting locations. The system will remember the last slip map level you used even after power off/on. 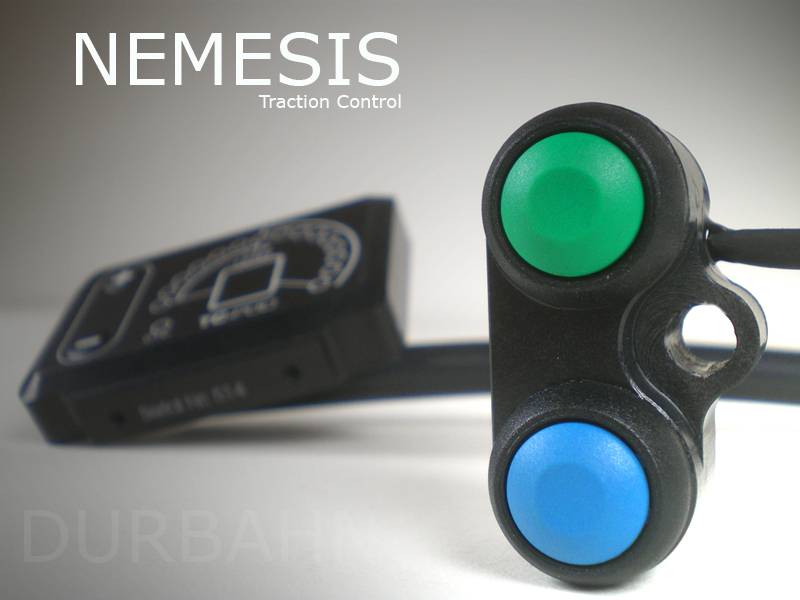 • Use the + (UP) button to increase the number and provide closer (more aggressive) slip control. • Use the - (DOWN) button to reduce the number and provide lower (less) slip control. • To turn OFF the traction control system, hold down the – (DOWN) button until a 0 shows in the centre display and the LED turns red. • To turn ON the traction control system press and hold the + (UP) button until a number appears. This will be the map level you were using prior to switching off the TC. There are 2 ways of changing the TCS map level, either use the + and – buttons directly on the TC-Pod or use the remote handlebar mounted switches. The TC level 1>9 will be displayed in the centre of the TC-Pod. To turn off the Traction Control, use the (-) Down push button and hold for a further 2 seconds. You will see a ‘0’ in the centre of the screen and the red light will illuminate. To turn back on, hold the (+) UP button for 2 seconds. Which Traction control map should I use? This of course depends on your riding skills and your typical lean angle, so the best place to start is at the maximum (level 9) and then work down until you feel it is working the way you want it. In an ideal world this will leave you other levels above and below where you are. The graph below plots acceleration on the horizontal axis, and slip along the vertical axis with zero acceleration and zero slip at the bottom left corner. The blue trace is with new tyres and the red with worn tyres during the same race. You can clearly see that the worn tyres require more slip to achieve the same acceleration as the new tyres. If the TCS system were not changed during a race to target a higher slip map then the bike would be slower out of the corners, and a lot slower at full acceleration. It always seems alien to reduce TCS when the tyres are worn and certainly they do slip more. The user has a choice and it depends on their riding abilities. Increase the TCS to reduce the extra spin and accept the reduction in acceleration, or reduce the TCS to allow the tyres more spin and maintain the acceleration, but this requires greater rider skill. Remember also, you are not removing the traction control; you are simply permitting it to spin more. The control is still there. By default the TCS module has the quick shifter input enabled but the user has the option to turn this off via the TCPod using the following procedure. • Turn on the ignition and the TC-Pod will go thought the normal start up sequence with the blue LEDs rising. • While this is in progress, press and hold the + (UP) button. • The TC-Pod will show a 1 in the centre and a green LED. This means the quick shifter is enabled. • a short press of the – (DOWN) button will change the display to a 0 and the LED will turn RED, this means the quick shifter input is disabled. • To go back to quick shift ON, use the + (UP) button. • To save settings, press and hold the + (UP) button and the Pod will re-start. • If you see a yellow LED it means that the quick shift has been disabled by the TCS internal programming so it is not possible to activate it via the TC-Pod. The TC-Pod will not go through the normal start up sequence, it will show a number from 0>9 in the centre and corresponding number of blue LEDs. Use the UP or DOWN buttons to adjust the brightness of the display, 0 being the lowest, 9 the brightest. When you get to your desired level, press and hold the UP(+) button for 2 seconds. The TC-Pod will now run through the normal ‘power on’ sequence. The TC-Pod will then revert to it’s normal operation. These brightness settings will be saved even after power off/on.